Quixx Care System products, anyone? They carry a variety of car care products may help you drive safer this holiday season. Protect yourself and wildlife. How? Let's begin with what happened this morning. I woke up and got outside only to find it so foggy that I could barely see anything in front of me...well, what does that matter? Err, if I can't see where I'm driving, it can get dangerous right? According the the Federal Highway Administration, an average of 38 700 fog-related crashes occur each year and that's not a small number! To avoid these accidents, avoid the fog...but we can't hide out at home all day, right? So what now? If we can't avoid, we have to improve our headlights so that we can see optimize visibility in these conditions. 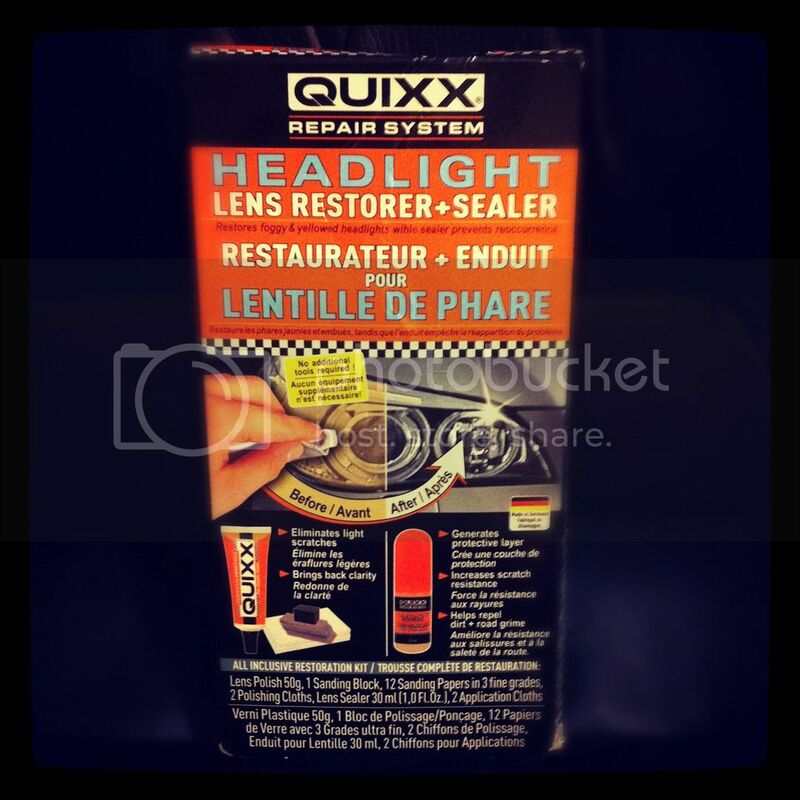 QUIXX Headlight Restoration Kit was sent to me for review and has the ability to restore yellowed and hazy headlights to their original clear and scratch-free finish. Everything comes in an all-in-one box so there's no need to go hunting for additional parts or pieces. Think about it, bad headlights is like wearing glasses at the wrong prescription. How will you see properly? The Kit comes with a lens polish, lens sealer, ultra fine sand paper (2000, 3000 and 5000-grit) and sanding/polishing block (wrap the sandpaper around this for a better grip), and polishing clothes! Their instructions say that sanding is usually not needed unless you're removing light scratches because the polishing compound is just that good. So, this kit was fairly easy to use and the instructions are on the side of the box, easy enough to follow. Apply the polish after wet-sanding the lenses for a few minutes. I, in particular, like the Headlight Lens Sealer, which creates a hard and long-lasting, weather and detergent proof layer against the harshness of the environment. So, after I clean off my lens, this sealer protects the glass, prevents scratches, and keeps the lenses cleaner allowing for a safer and brighter drive. At $19.99 per kit, its not bad, considering it'll restore your headlights without you having to replace a whole headlight, which definitely costs more than that. A fair word of warning though, this will work fine and great with the lighter scratches but if you have really deep scratches, I'm not sure how well it'll do. However, this would be a great gift idea for the car buffs in your family this holiday season. Buy It: Quixx products are available online or in stores (Strauss Auto Stores, Canadian Tire). From now until December 21, 2011, Quixx will donate $1 to Wildlife Foreever for every person who buys the Headlight Restoration kit ($19.99), likes their facebook page and/or follows them on twitter. Visit their site for more information. Win It: 5 Whirlwind of Surprises' reader will win a tube of Quixx Car Wax for themselves!! Come back to enter the giveaway! Make it easier on yourself by showing the sponsor some love now: Like QUIXXUSA on facebook. Follow @Quixx_USA. The headlights on my son's car could really use sprucing up. It's affects his visibility at night and I would love to get this product for him. My husband's car really needs this. My husbands truck headlight could really use the Quixx!